Don't forget the furry ones! Animal Protective Shelter with filter for small Pets. Two feet wide by two-feet six-inches in length. 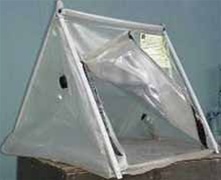 Light weight and very easy to assemble, the pet shelter will provide a strong protection for your beloved pet. Filter included to provide your beloved pet with fresh, filtered air. PLEASE NOTE: Due to size & weight, this item will only ship PARCEL. Priority shipping is not available.